Commercial Sign Supplies In Stock Now! These Sign Supplies Get Noticed! Buy Wholesale Sign Making Supplies Online Today! 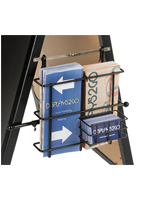 These sign supplies, sandwich boards, fold to open and close. 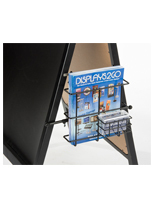 This double-sided sign supply features two hinges that lock open to keep these portable sign supplies securely upright. 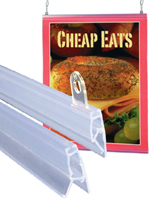 The hinges are also very easy to open and close, making these easy to transport sidewalk signs the perfect choice for every business. 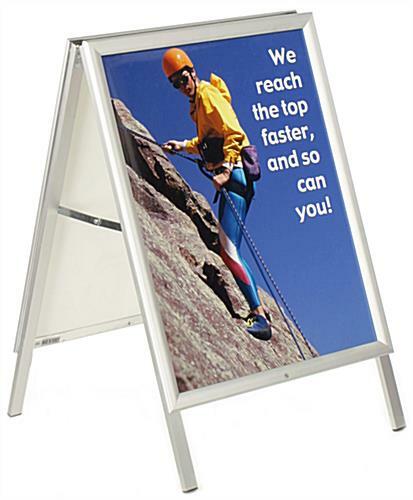 These sign supplies are made of durable aluminum making it a lightweight sign that resists rust. The sign supplies have a snap frame that snaps open and closed on each edge to make inserting a graphic beneath the protective lens almost effortless. These outdoor sign supplies, wholesale sign making equipment, sandwich boards, and sidewalk signs are temporary units that can be set up and stored with ease. Buy wholesale sign supplies online and attract customers you're your doors! 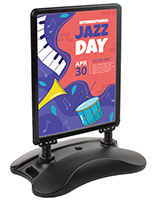 These lightweight sign supplies feature a 1" wide frame so a 1" allowance should be made to account for the frame width when designing graphic inserts. These ready to sip sign supplies for sale at discount prices are the ideal promotional tool for every business. Advertise special sales, events, and other information with an outdoor advertising sign! Included with your purchase is a weather resistant PVC plastic lens that keeps the graphic dry in mild weather. (Sign should be brought indoors during storms.) The non-glare lens allows passersby to read your message in both dim and glaring lighting conditions. 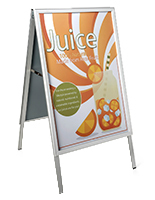 These commercial sign supplies on sale at wholes prices are the ideal choice for those with smaller advertising budgets. Please Note: Item is not intended for use in inclement weather, including high winds, rainstorms, extreme heat and snow storms.